What's holding you back from business success, marital bliss or parenting nirvana? More than likely it's under the radar or below the surface of what you think. Maybe, it's like a pebble in your shoe that's irritating, uncomfortable, nagging and eventually crippling. 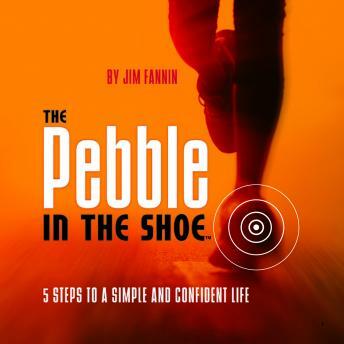 In The Pebble In The Shoe, author Jim Fannin tells a simple story where you'll learn how a seemingly undetectable pebble can stop you from achieving your fullest potential. Some pebbles are lodged only in your business shoes. Some reside in your house slippers that you tuck under your bed. Some pebbles find their way into your golf shoes while others form in the shoes worn while you parent. Unfortunately, some pebbles travel in all your shoes regardless of where you walk or run. In The Pebble in Your Shoe, the World's Number 1 Coach of Champions gives you five simple, champion-tested tools for removing the smallest to the largest pebble in your shoe. After hearing this audio, you'll be able to approach any condition, circumstance or situation with confidence. Jim Fannin is the 'World's #1 Coach of Champions' by producing more champions in sports, business and life than anyone on earth since 1974. He is a mental performance coach, author, professional platform speaker, life strategist, sports & business consultant, and former professional tennis player. He has 35+ years of professional coaching, consulting and public speaking experience. Mr. Fannin has privately coached hundreds of professional athletes from 10 sports with 25 MLB All-Stars (including 4 Cy Young Award winners, 6 MVPs and two batting champions), Olympic gold medalists, seven world's top-10 ranked professional tennis players (including a 4-time Wimbledon Doubles Champion, French Open Champion and Runner-up), NBA All-Stars, NFL All-Pros, MLS MVP and 10 golfers to win their first professional tournament. In addition, Jim has personally trained tens of thousands of corporate executives and hundreds of companies from 50 industries in peak performance.